Do you need new commercial flooring for your business? 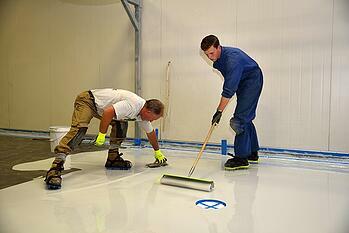 Many business owners find their properties look best with an epoxy floor coating. Not sure this is the right material for the application you have in mind? Consider the benefits of commercial epoxy floor coating and you’ll realize just how versatile this option really is. Epoxy is naturally waterproof. Having a floor that won’t absorb moisture is beneficial for many reasons. First, it makes for easy cleaning since all you need to do is mop the floor to remove dirt and grime. Spills won’t stain the non-porous surface, nor will road salts that stick to tires and the bottom of your shoes. Second, moisture resistant flooring prevents water from damaging the subfloor or promoting mold growth. This prevents you from ever having to repair or replace the subfloor entirely, saving you money and avoiding the need to interrupt business. It’s hard to find a flooring material as affordable and yet durable as epoxy. It’s resilient in high-traffic areas, making it ideal for commercial applications. The material also withstands chipping from impacts, chemical staining, extreme temperatures and surface abrasion. When you choose epoxy floor coating, you don’t have to panic if your drop a wrench or a bike falls over. Epoxy can even conceal small cracks and flaws in the concrete, wood, tile or other surface you cover with the material. The ability to adhere permanently to many different surfaces ensures the epoxy won’t peel or crack over time. Epoxy is made of colored acrylic flakes available in a wide variety of color combinations. Choose from standard color options or request a custom blend. The ability to tailor the floor pattern and color allows you to match your brand. A variety of topcoat options lets you choose from a deep, glossy shine or a matte finish, depending on your preferences. Topcoats also grant additional features, such as increased durability and anti-slip qualities. If you’re excited by the idea of improving the functionality, durability and appearance of your business just by installing a new floor, please schedule a free on-site design consultation with the experts from Boston Garage to learn more.